NOAA issues spring outlook, predicts flooding in the usual places, more drought for Cali and the Southwest | Watts Up With That? According to NOAA’s Spring Outlook released today, rivers in half of the continental United States are at minor or moderate risk of exceeding flood levels this spring with the highest threat in the southern Great Lakes region due to above-average snowpack and a deep layer of frozen ground. 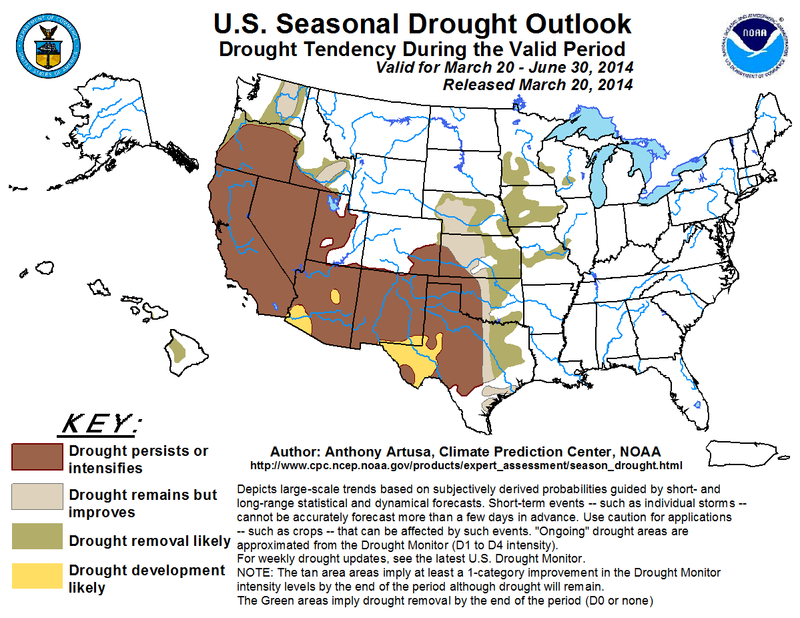 Additionally, drought is expected to continue in California and the Southwest. The continuation of winter weather, above-average snowpack, frozen ground and thick ice coverage on streams and rivers will delay spring flooding into April in the upper Midwest eastward to New England. The intensity of the flooding will depend on the rate of snow and ice melt, and future rainfall. Continued well-below average temperatures this winter resulted in significant river ice formation and ice jams in locations further south than customary, flooding homes and businesses, and impacting river commerce. There is also an elevated risk of more ice jams this spring in the northern tier of the U.S. from Montana eastward to northern New England. National Weather Service hydrologists predict moderate flooding in parts of southern Wisconsin, southern Michigan and portions of Illinois, Indiana, and Iowa as a result of the current snowpack and the deep layer of frozen ground coupled with expected seasonal temperatures and rainfall. At risk are the Mississippi River and the Illinois River as well as many smaller rivers in these regions. Small streams and rivers in the lower Missouri basin in Missouri and eastern Kansas have already experienced minor flooding this year and the threat of moderate flooding will persist through the spring. There is a risk of moderate flooding along the Red River of the North between eastern North Dakota and northwest Minnesota, and along the Souris River below Minot, N.D. River ice, snowpack and significant frozen ground are factors in the flood risk for this area. Additionally, there is a risk of moderate flooding for western South Dakota because of current saturated soils. Minor flooding is likely in the northern Rockies, parts of the Midwest, and the Great Lakes region. Minor flooding is also possible in the Northeast, the lower Mississippi River basin, and across the entire Southeast up to Virginia, including east Texas, and parts of Arkansas, Tennessee, Kentucky, West Virginia and the Florida panhandle. 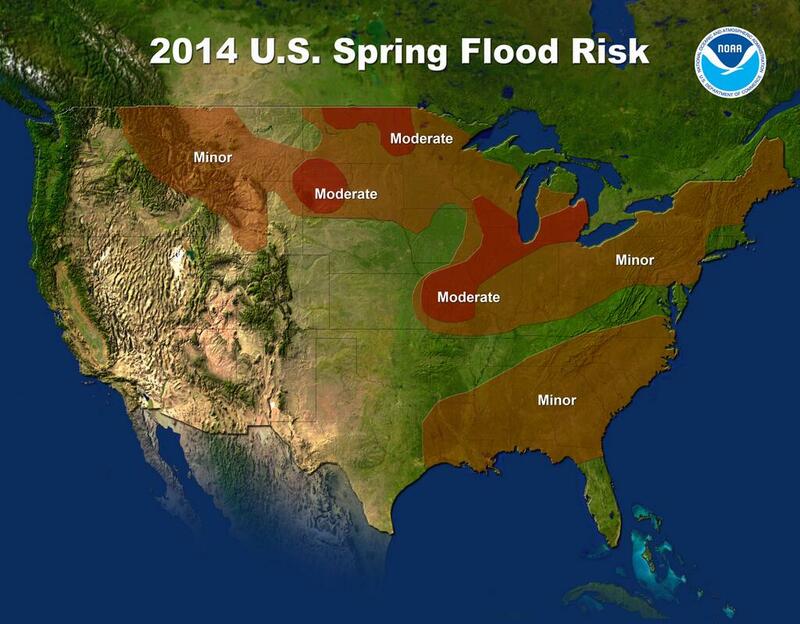 In these areas, spring flood risk is highly dependent on rainfall. Significant and widespread drought conditions continue in California which experienced its warmest and third driest winter on record. Drought is expected to persist or intensify in California, Nevada, most of interior Oregon and Utah, Arizona, New Mexico, southeast Colorado, western Oklahoma, and most of west Texas because of below-average rain or snow this winter and the onset of the dry season in April. If the drought persists as predicted in the West and Southwest, it will likely result in an active wildfire season, continued stress on crops and livestock due to low water levels, and an expansion of water conservation measures. Drought removal expected for the Big Island of Hawaii. Drought improvement is likely in Washington, southeast Idaho, extreme northern and coastal Oregon, western and central sections of Nebraska and Kansas, central Oklahoma, and the Midwest. Drought is not expected east of the Mississippi River during the next three months. More information about drought can be found at www.drought.gov, a clearinghouse of drought-related materials managed by NOAA including maps, tools, and information to help prepare for and mitigate the effects of drought. Below-normal temperatures this spring are favored for an area from Montana eastward across the northern Plains to the Great Lakes region, while warmer-than-normal temperatures are most likely for western sections of Washington and Oregon, California, the desert Southwest, the southern Plains, the Southeast and all of Alaska. For precipitation, odds favor drier-than-normal conditions for the Alaska panhandle, western Washington and Oregon, California and parts of Nevada and Arizona. Hawaii is favored to be both warmer and wetter than normal this spring. NOAA’s Spring Outlook (see our video) identifies areas at risk of spring flooding and expectations for temperature, precipitation and drought from April through June. March 16-22 is National Flood Safety Awareness Week, NOAA encourages individuals to become weather-ready by ensuring you have real-time access to flood warnings via mobile devices, weather radio and local media, and avoiding areas that are under these warnings. Empowering people with the information they need to take action to protect life and property is key to NOAA’s effort to build a Weather-Ready Nation. March 20, 2014 in Climate News, Forecasting, NOAA. Reading their Mission Statement @ the end of the article & I’ll realized that I think these people are living in an intellectual “La La Land”. How do they expect to be very good at anything, when such a varied number of scientific disciplines are involved? Why not concentrate on 1 or 2 & instead of trying to be an expert on so many? Bobby, please try and keep up. Omni Science is a tiny sub-branch of Climate Science! What does the Old Farmers Almanac say? The flood predictions, due to record snow melt, is a no-brainer. Lack of rain in West Texas, ho-hum. And, where is the prediction of an El Nino, that appeared about two months ago? No wonder private forecasting services make so much money…. I’m looking forward to their safely crafted but still wrong hurricane season outlook. I’m impressed! Except for a sideways reference to California’s warmest and 3rd driest winter, there were no obvious political statements in this report from NOAA. How refreshing! I’m impressed! Except for one sideways mention of California’s warmest and 3rd driest winter, there were no obvious political comments in this report from NOAA. How refreshing! “Minor” risk of flooding in my area? Well, seeing as how they blew the temperature record, that’s understandable: they don’t realize how much unmelted snow is still on the ground (answer: a good 18-24″ above average for mid-March). We’re a thaw and one good rain storm from serious flooding. I look at the Central North and see drought and flooding. One would think an opportunity exists for capturing some of that flood water to alleviate drought conditions. But then, I live in California. We build bullet trains between backwater towns instead of reservoirs, and cry about drought/flooding all the time. I just assumed all the idiots lived here, leaving saner minds in the rest of the country. I guess we’re just all stupid. I can predict it’s going to flood where it’s always flooded, and going to be dry in California, where it’s usually dry. And I didn’t charge the feds for the (equally as likely) prediction. Nothing, the Old Farmers Almanac can’t talk. You didn’t get paid because you didn’t word it as a proper prophecy. It shall flood where it flooded in the time of our ancestors. There shall be droughts where there were droughts in ages past. how did NOAA do with their winter outlook? Since NOAA is often wrong, for those of you living in the areas which they say will be dry I can do you a good discount on a line of lifejackets and buoyancy aids. Kudos to Mkie Halpert…that was dead bang. But, in spite of this most excellent advice, they predicted the weather anyway. It doesn’t take a supercomputer to predict that. My brother predicted it just by living in the ice and snow. More to the point, what good is “moderate flood potential” to anyone in harm’s way? How high is the water supposed to get? What year’s is this year likely to emulate? It is evident that NOAA has put a lot of effort into message refinement in place of model improvements or program reform. How many inside-track consultants and staff years went in to that effort? C’mon, when was the last time that a government agency or bureaucrat ever existed to “empower people.” Fire that Communications Director. Along the same lines, we can predict that North American temperatures will generally rise during the first half of the year, with cooling trends expected in the fall. Days are expected to get longer, peaking in June, followed by a shortening trend through to the end of the year. Solar illumination will follow a 24 hour cycle of alternating brightness and darkness. Meh, didn’t NOAA assign an E/C for warm/cold to much of the country this winter? How’d that work out? Does that mean 100″ instead of the usual 120″? Does anyone else think it’s funny that they chose the “green” areas of the US to call for minor flooding (except in the north, where there is lots of snow) and the “brown” areas are going to be in drought. It’s like they, um, looked at what’s normal, or something. 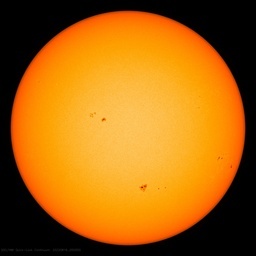 Let me add a prediction – The sun will appear to rise in the east. So it will flood where it floods, and be dry where it is dry. Darker tonight, followed by a possibility of tomorrow. Their “Drought Outlook” is kind of a laugh. Looks exactly like the current drought status. I noticed that NSIDC has also left the climate change spiel out of their last several reports. Their report reads much better that way, with a highlighting of observed natural changes stated in an objective manner. I would forecast California and Oregon weather to be towards the cool side this summer. The cooler sst flows in the western North Pacific are going to push towards Alaska and the Pacific Northwest. NO Accurate Assumptions. Same old, same old.